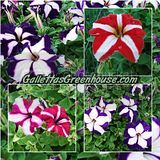 Meet the family at Galletta's Greenhouse! John Galletta (right) with son-in-law Wesley Stevens (left) and daughter Mary Stevens (middle). Photo taken on New Year's Day 1996. 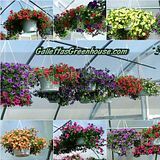 Galletta's Greenhouse was founded by the late John J. Galletta. One of Mr. Galletta's wishes shortly before he passed away is that his family would continue to run the business he started. Galletta's is now owned by his daughter Mary, and operated by Mary, her husband Wes, her sons Matt and Chris, and daughter-in-laws Rungnapha and Melissa, making it truly a family-operated small business. Galletta's is not run by millionaires, a franchise, or mass-growing wholesalers. 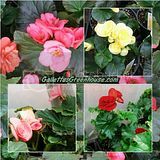 But, along with a little help by others in the family, Galletta's has expanded a little each year, and the family carries on the tradition of highest quality plants for the lowest possible prices in the Oswego County area and points beyond. Mary Stevens inherited the business from her father, John Galletta. She had no prior interest in the greenhouse, but mainly agreed to run it when her father asked her to due to age slowing him down. After his passing, she agreed to run it for her son Matthew, who loves the greenhouse with all of his heart and was devastated when his grandfather passed away. Mary oversees the business, transplanting seedlings and plugs in the winter and is often found waiting on customers during weekday morning-to-afternoon hours in the spring and summer, making beautiful specialty planter baskets, and pitching in with watering. Matt is the head grower at Galletta's. He is the one most responsible for the healthy and beautiful plants. As a child, he followed his Grandpa Galletta around and learned everything he could from him. 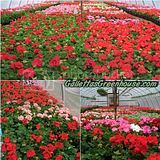 Winter through Summer, he oversees all of the planting and most of his time during growing season is filled with watering, maintaining heaters, and making sure everything in the greenhouse is perfect to make the plants grow into what you see and buy. When the season winds down, Matt turns his attention to karting, as he co-founded and races in the Galletta's Karting Club. Established with his brother in the early 1990s out of both the brother's love of Supermodified racing and as an affordable alternative to costly pro and semi-pro racing circuits, Matt is responsible for co-designing, co-building, maintaining the fleet of all of the house karts, as well as assisting with all visiting drivers karts. He also built the John J. Galletta Memorial Backyard Karting Speedway virtually by hand, and is respected (and hated by some) for his undisputed karting mastery as seen as all-time leader in wins and points of the largest and longest-running of all Oswego kart racing divisions. Wes is the all-around dirty-job man at Galletta's. When he is not at his day job at Wiltsie Construction in Oswego, NY, he re-builds, and maintains the buildings that his late father-in-law built in addition to building new greenhouses under his son Matt's supervision. He used to plant more, and still does occasionally. He also waits on customers on weekends and pitches in with watering from time to time. He is affectionately known as "Ogre" to many, although John Galletta called him "Captain Marvel" due to his hard work. Wes also assists his son in the building and rebuilding of karts due to his fabrication skills, and used to race with them until he retired from racing in 2007-08. He now helps his sons' karting club as a flagger and race starter. Chris transplants seedlings in the winter, assembles many of the combination planter pots, stocks and waters in the spring and summer. Much like his brother, he has been doing so since he was a kid as well. Chris is also the builder, owner, photographer and webmaster of this very website, stemming off his career as a graphic artist. He uses Galletta as his pen name in honor of his mom's family business. When he is not working in the greenhouse, or doing one of his dozens of hobbies that take all his time, he is probably creating comics or maintaining his websites. He illustrates all of the Galletta's Greenhouse cartoon ads printed in local newspapers, many of which feature his comic strip character Towner and can be found in the reprinted collection, The Adventure of Towner & Friends. He also created a comic book and graphic novel, Chrusher Comix, publishes his own comics and their websites, the flagship being the website for his graphic art projects, ChrusherComix Art Studios. Chris can also be found racing karts with his brother, being second only to his brother in wins and points of the largest and longest-running of all Oswego kart racing divisions, and also produces the karting club's DVDs and YouTube videos, documenting all of the races, adding the statistics, and maintaining the website for the club. 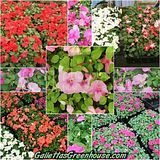 Although Chris' wife "Aou" is originally from Thailand and has only been at Galletta's since the 2005 season, she is already a master of beautiful window box gardens, combination pots and specialty items such as coconut baskets. Customers can't say enough about her creations. In addition to helping her husband with the website photographs and descriptions, she also transplants and pitches in with watering as well on her days off from working at the Thai Rose in Oswego, NY. When Melissa is not at her day job as Teacher Aide in North Rose Elementary in Wolcott, NY, she helps her husband Matt in the greenhouse, mostly on weekends since the 2007 season. She does soil work by filling flats, baskets, and pots during the winter months and labeling the flats. In the spring she helps with transplanting and seeding the vegetables. In the Summer she helps with watering and stocking. She also helps with some window boxes, combination pots and coconut baskets. When it is go-karting time she helps her husband Matt with getting the karts and track ready for racing. Also chipping in from time to time -- although not on facebook -- are Mary's brothers Jerry and Gene Galletta, who help stock and assist customers.